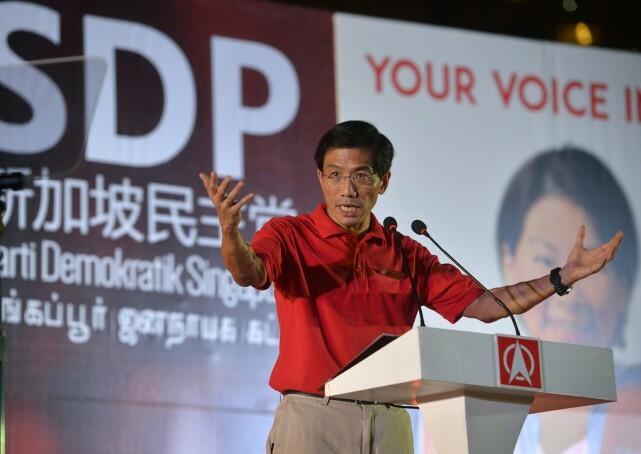 The Singapore Democratic Party (SDP) held their third rally on 5 September for the much anticipated 2015 General Election. Held between 7 pm to 10 pm, the rally was held adjacent to Commonwealth MRT station for Holland-Bukit Timah Group Representative Constituency (GRC). Eight rallies were scheduled yesterday after the contesting parties received their permits from the police. Scores of people turned up for the rally. The SDP volunteers sold party merchandise like books, flags and light sticks and election literature during the rally to ardent supporters. Despite the large crowd and interval cheering and honking for each speaker, the crowd was well behaved and orderly. There was a party fervor from members of the public throughout the rally. There was a cluster of people on the Commonwealth MRT overhead bridge. The SDP is one of seven parties contesting the 2015 General Elections. Founded in 1980, the party is currently led by secretary-general Dr Chee Soon Juan, who is contesting for the Holland-Bukit Timah GRC. From the very start, the SDP has placed the high cost of living and the need for a minimum wage on the top of its manifesto. One of the SDP candidates, Chong Wai Fung, an administer for a nursing home, angles her speech on the plight of low income Singaporeans, especially those sleeping on benches and collecting card boxes. She elaborates that is it difficult to quantify how many poor people there are because the government does not want to define a poverty line. She also shares the party’s proposal on setting up a wage equity commission to recognise the minimum wage for workers to cope with the rising cost of living. The commission will include representatives from trade unions and social work organizations. The second last speaker, Professor Paul Ananth Tambyah enthralls the crowd by sharing his journey in the SDP and bringing up virtuous issues such as the local healthcare system. A medical doctor by profession, he narrates personal stories of patients struggling to pay the high healthcare costs. He echoes his support for Dr Chee and debunks the narrative that Dr Chee is a ‘radicalised man’. “When I first met Dr Chee in person, I was stunned to discover that he was nothing like the picture that was painted by the mainstream media. He was just an ordinary guy with a deep passion for Singapore and for Singaporeans,” he said. By 9 pm, the crowd was earnestly waiting for the Dr Chee to deliver another impassion speech after his historic speech the previous evening. He received an applauding welcome when he steps onto the stage. Dr Chee touches on hot button issues such as the impact of the foreign inflow on train breakdowns, the Little India riot where the police were not equipped to handle the unrest and stress levels for Singaporeans who face competition for university places.